It has been two weeks now since FaffCon 4 in Ventura. A day doesn’t go by that I don’t have some sort of memory pop into my head. Starting with Thursday night helping Pam and Lauren write questions on blow up soccer balls. We got so good at the task that we actually did more than we needed to. We laughed a lot in the process – which is something that a lot of us did a lot during the weekend. One of the most amusing memories was the debate over what color walkie-talkies went to whom. The sunglasses decided it. Later in the evening, I met up with a few of the early arrivals in the hotel bar – hugs all around (and my dear friend Liz bought me a nice glass of wine!). Friday morning memories of endless hugs as friend after friend came up the stairs to pick up their badges, meal tickets, water bottle, tee-shirt and tote bag. 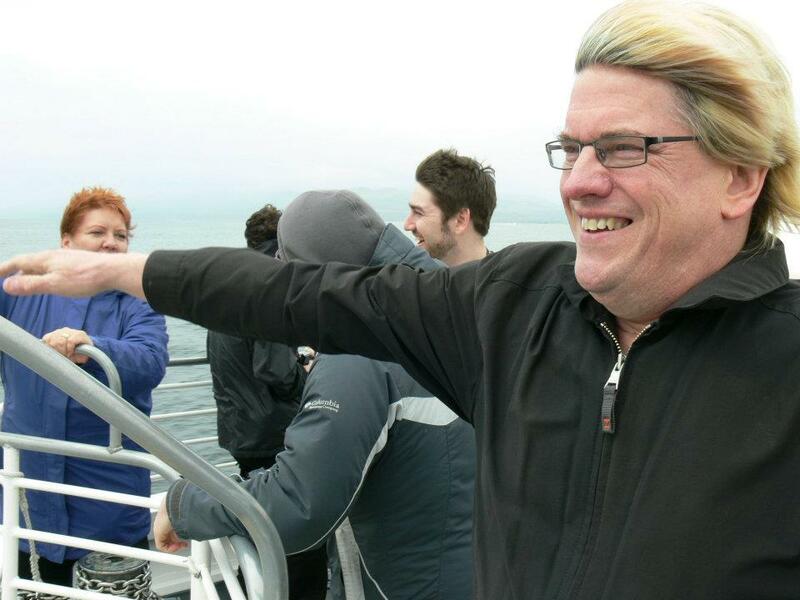 Then, Friday afternoon, the boat trip on the open seas with my friend Steve Savanyu doing the Titanic pose on the bow. We saw a big bunch of dolphins, but no whales. As it turns out, a pod of killer whales popped up after the morning trip and the big whales skedaddled. Friday evening after the opening circle – “auditioning” for Dean Panero of Abrams during the Voice Registry Live Weekend Workout. Here is Natalie Stanfield Thomas up at the mic. If she was quaking half as much as I was, she sure didn’t show it! Saturday was simply a blur – but oh, those adorable dolphin cookies! Audio-Technica sponsored that much needed afternoon break. Was it Saturday when Eric and Devin made a shark swim over our head’s during lunch? The mad scramble as I took pictures of door prize winners at the FaffCon Shower Curtain backdrop is forever etched in my mind. Sunday flew by too fast and suddenly it was over – until the next time. Thank goodness our friend Dave Courvoisier sponsored the notebooks in our tote bags, or I would forget all the great things I learned during the sessions even before the faffterglow wears off. The word faffterglow was coined by someone shortly after FaffCon 1 and will soon be entered into the lexicon. I don’t think anyone leaves a FaffCon without that faffterglow. And it has a way of sneaking back into your mind long after the event is over. If you were there for the first time, just see what happens when your little postcard to yourself arrives. Like a magic carpet, you will be back in Ventura. My faffterglow hasn’t been all warm and fuzzy, it included losing my camera somewhere between Anaheim and my house. I either lost it on the train somehow, or it ended up in the trunk of the gypsy cab that I managed to take from the train station. So all of my Sunday pictures are lost. But we will survive. The event has been thoroughly documented. Check out the FaffCon Facebook page for right now, but the FaffCon 4 Gallery will be up on the website in a few weeks. Set your computer clocks to remind you about FaffCon 5 in about three months. That is probably when past Faffers will start getting notices to be ready for our early opportunity to register. With four of these under our belts now, and the pool of past Faffers growing, there is a good chance that FaffCon 5 will sell out in the pre-sell! Mostly I write the blog because I like to write. But for a blog to be seen, the writing must be a bit more consistent – and promoted well to build loyalty. On the class blog, I have a somewhat captive audience. On this blog, I have a few followers – much like I follow a few as well. The class blog – http://sdccd106.wordpress.com/– was just featured on the onlinedegrees.org website as one of the Top 100 Classroom Blogs. So I guess someone is reading that blog besides my students! Professional video and multimedia producers know there is a lot more involved in a successful voiceover than simply recording the voice and slapping it into a time line. You need to connect and communicate with the audience. 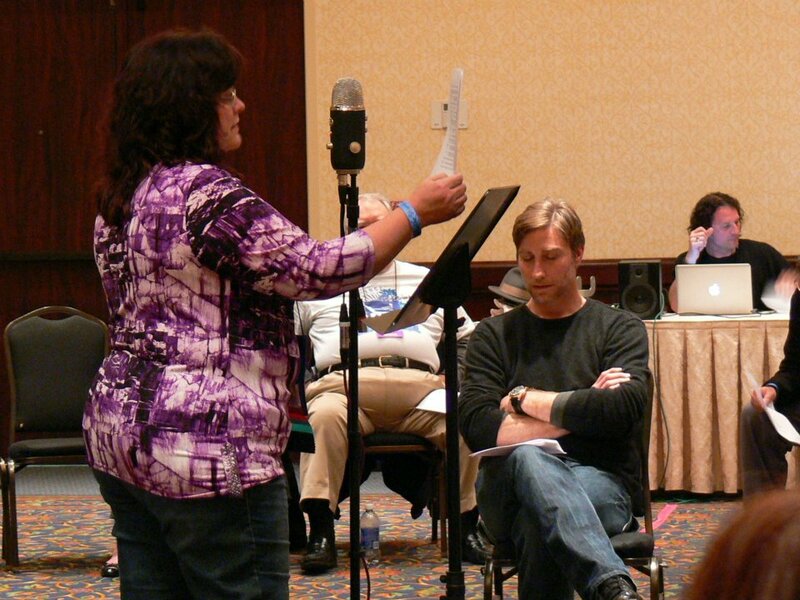 The process starts with the initial selection of the voice talent for a particular project. Start early and try not to scrimp on the budget for the talent. You want a voice that will be able to get the “right” read in the shortest amount of time. If you have questions about what to budget for talent for a particular project, make a few phone calls (to another producer, to talent you respect or best yet, a talent agent) and see what the going rate should be. You can usually find someone to do the job for practically nothing, but very often what you end up paying in extra studio time to get mediocre results will more than offset the cost of hiring a professional at a fair rate. Listen to demos – either from an agency house CD or their website, or demos from individual talent. It gets easier and easier to find demos, but it can be hard to determine if the person you like can deliver the goods. Not everyone’s demos reflect their actual capabilities these days. Visit their websites. Listen to additional actual projects other than their generic demos. Ask for an audition if needed. If using an online automated casting site (commonly called Pay-2-Play by the voice talent because of the fee required to receive auditions), be prepared for a flood of auditions ranging from great to horrible. Another approach is to talk to an agent and describe the voice in your head. If you are casting for several voices, consider a casting director. These people know their talent and will be able to assemble a more focused set of auditions rather than the avalanche of right and often very wrong demos you will get with the automated systems mentioned in the previous bullet. There are also more personalized online casting services/audio production companies who will listen to your requirements and send notices out to a short list of professional talent who have been invited to be on the website. Make sure you are listening to the right kind of demo. 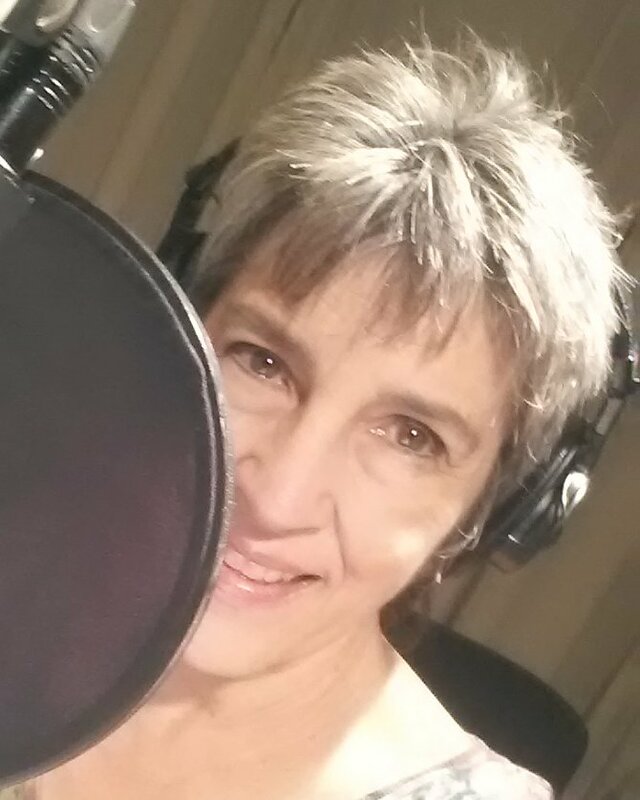 If you are seeking someone to narrate a 20 page script, listen to narration demos. If the talent only has a commercial demo, chances are they may not be used to reading long form material and may not be able to wrap their brain around your 20 page script without a lot of direction. Some talent agency compilation demos only feature commercial demos, so be sure to keep this in mind. If you are listening to a custom demo using a portion of your script, do yourself a favor and narrow down the field to the top 5 or 6 and then hold another casting session with some specific direction. If you are using one of the online services to get your initial demos, you can do this step remotely as the talent responding will have their own/or access to studios. This will help you discern whether the talent can be directed or not…always a good thing to know even if the talent is going to “self-direct” and send you clean tracks. It will also help you determine if the talent’s studio is up to your professional standards. How do you get the “right” read? Remember the caution above about hiring talent for long form work who have a knack for long form work? Talent used to doing commercials may be able to understand the scenario that takes place in a 60 second spot, but may not be able to understand both the forest and the trees in a 20 page (or 100 page) script. Not only that, for scripts that will take over an hour in the studio, you need to know that your voiceover person can keep the same level of energy and approach from the first sentence to the last. The right voice will be able to quickly read through the script (or part of the script), understand the overall approach and come up with a delivery style and pace that is pretty close. It is always in your best interest to let the talent in on who the audience is and what you want them to do, feel, or think after watching the presentation. Let the talent know his or her role…fellow employee, a helpful teacher, or perhaps a trusted superior. And don’t forget to let the talent in on the level of audience understanding or interest in the subject matter. A good narrator is digging into what really happened. They are reading under the words – around the words – between the lines. They look for the nuances of meaning that lurk beneath the ink on the page. They think about what might have happened just before they open their mouth to read a particular sentence. Was it funny? Is this a transition point in the video? You need to have all of this running around in your head too – so that you will know when the narrator’s interpretation wasn’t quite right. As a director of voice talent, you need to be able to effectively communicate your desires so that the talent can make the right adjustments to their delivery. In general, the more professional the talent, the less they need to work with – a grunt, a look, one word – may be all it takes and the next take is starred. The best talent needs little if any direction, particularly if you have selected the right voice for the project, or if you have worked with that talent before. Some talent may require a bit more finesse to understand what you are hearing. This is where your understanding of the script and having a large vocabulary of adjectives will come in handy. Oh, and the fewer people directing the talent the better…but you know that. However, as a professional voice talent and scriptwriter, I have found that there are a few technical things you can do with the narrator’s script that will make the session go even more smoothly. You may have the entire presentation in your head, but unless there is something on the script that helps the narrator see it the way you do, you will be working a lot harder than you need to. Be sure to let the talent have as much information as possible about what is happening. This may mean taking a few minutes ahead of the session to discuss it. Believe me, it is well worth the time. It also helps if the script is easy to read. I’m not getting into the actual script writing here – that’s another topic for another time – these tips are for formatting your script to help the talent move through it quickly. If your script includes sound bites, be sure to include a transcription of the words that the narrator will be leading into and coming out of. This will help overall continuity and flow. Double space the script so that the talent has room to mark the copy. Use at least 12 point font – Times Roman is good. Use upper and lower case – ALL CAPS ARE MORE DIFFICULT TO READ. Think about it, the talent has no way of knowing if something should be capitalized if everything is capitalized. This could affect interpretation. Try to avoid breaking a sentence in the middle from one page to the next. This will reduce the number of times you have to stop down for page turns, as well as possible page rustle. 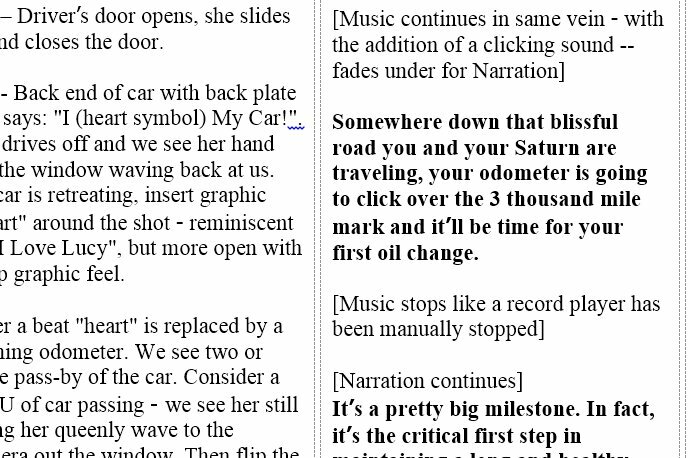 If you are using a dual column editing script as a narration script, some sentences may be broken in the middle of a thought to show the editor where a new image is supposed to appear. While most professional talent can mentally take up the space and tie the sentence together, try to avoid this on the script you hand the talent. The audio track is a critical element in your media project. By selecting the right talent in the first place, formatting the scripts for readability and then working with the talent to get the “right” read, your media projects will connect and communicate.